Chicken dum biryani recipe: chicken biryani using ‘dum’ method is probably the longest standing recipe in my to-make list. While a quick chicken biryani is sufficiently satisfying, dum biryani is really special, especially when meat is involved. I hope this very detailed step by step recipe to make chicken dum biryani helps you, even if you are not a very skilled cook. I actually made this for the first time using this recipe and it came out perfect in the first attempt. Because I apparently like suffering in the kitchen in tropical Singapore, I set aside a full morning to make this chicken dum biryani and vegetable dum biryani simultaneously. While it may seem like a LOT of work, which it is, a lot of the preparation work can be done in one go, like slicing onions, soaking and cooking the rice, grinding the garlic, ginger, and chillies, soaking the saffron, etc. Ironically, making chicken dum biryani is quicker and easier than the vegetarian version because of a lot less cleaning and chopping of vegetables. The only thing that needs some advance preparation is the marination of the chicken, a step I would not recommend skipping because that’s what make the chicken super tender and hold its own when dum cooking the biryani. If you really want to prepare this chicken dum biryani recipe the right way, I have one request. Even if you may not be the hugest fan of spending a lot of time in the kitchen, do not skip any steps mentioned here. To prepare better and save time, I’d follow these steps in order. Alright then, we are all set for the detailed recipe on how to make chicken dum biryani, so let’s get right to it. In a blender or mixer jar, add all the ingredients needed for marination + salt. Grind coarsely. Add the soaked rice to this. In the same ghee, fry the cashew nuts, drain and then fry the raisins and drain. Now, in the same pan used for frying the onions, top up the remaining 1/4 cup ghee (see notes). Add the marinated chicken pieces and mix well. Let this cook for 30 seconds. 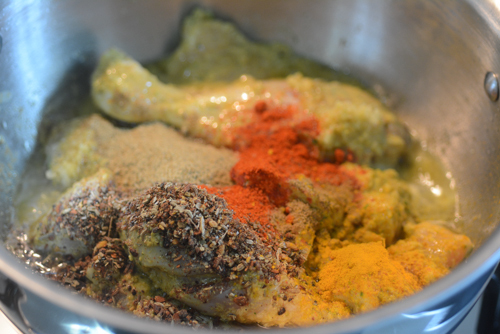 Then add the freshly ground whole spices spices or biryani masala and fry for another minute or so. Add 1 tbsp each of chopped coriander leaves and mint leaves on top. Mix well to combine. Layer the cooked rice over the chicken. Yes, the chicken is still raw, our dum cooking will cook it perfectly in about 15-20 minutes so this is fine. Keep the heat to lowest possible and cook for about 15-20 minutes. Since the lid wasn’t super tight, I placed some weight over it. Cook on very low flame for 15-20 minutes. Serve chicken dum biryani with raita and brinjal salan. – The raisins are optional. My mom also adds chopped pineapple sometimes. – The spices you use for making the biryani masala is up to you. I would recommend to use cinnamon, cardamom, cloves, and bay leaf as a bare minimum. – Do not skimp on coriander and mint leaves. Buy them fresh and use generously. that’s awesome to hear, thanks Shilpa! When you pre-boil the rice grains, how do u know when the rice is ready. I know you said it should not be mushy or cooked fully but roughly how long does it take before you can drain it? About 8 mins? i’d say 10-12 minutes depending on the heat used as well. Just take a grain of rice and try to smush it between your fingertips. If it gives without too much hardness, you’re there! I tried this last week and it’s the best!. For a biryani making novice the step by step pics are a blessing. Love this recipe and want to try it out this weekend. If I’m increasing the rice qty to 3 cups, how do I adjust the biryani masala? hi there, i would add another tbsp or so. the quantity of masala is really up to personal preference so grind more than you think you need and add as needed. the recipe is very forgiving.